George McClennon (clt), Eddie Heywood, Sr. (p), unknown (bjo). Note: These two sides were almost certainly recorded at different sessions. Tom Morris (c), Charlie Irvis (tb), George McClennon (clt), probably Bob Fuller (as), Clarence Williams (p), probably Buddy Christian (bjo), unknown (d). Possibly Seymour Irick (c), possibly John Lindsay (tb), George McClennon (clt), unknown (as), possibly Clarence Williams (p), possibly Buddy Christian (bjo), unknown (d,woodblocks). McClennon probably doubles on percussion on track 9. McClennon plays bass clarinet on track 11. George McClennon (clt) acc. by Eddie Heywood, Sr. (p). Unknown (c), possibly Charlie Irvis (tb), George McClennon (clt), unknown (as), Eddie Heywood, Sr. (p), unknown (bjo), unknown (d). Note: Eddie Heywood is credited on the label of Okeh 8236 as the piano soloist. 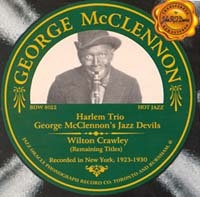 George McClennon (v) acc. by his Jazz Devils: unknown (c), unknown (tb), unknown (clt,as), unknown (bb). Unknown (c), possibly Jimmy Harrison (tb), George McClennon (clt), unknown (as,ts), unknown (p), possibly Buddy Christian (bjo), unknown (bb). Unknown (c), unknown (tb), George McClennon (clt,v), unknown (as), unknown (bjo), unknown (bb). Unknown (c), unknown (tb), George McClennon (clt,v), unknown (as), Eddie Heywood, Sr. (p), unknown (bb). Henry Allen (t), Wilton Crawley (clt), Charlie Holmes (as), Jelly Roll Morton (p), Teddy Bunn (g), George “Pops” Foster (bb), Bruce Johnson (wb).